I realized that I have been so busy, I haven't put together any Before and Afters for a while! So I'm thrilled to share some of my favorite recent projects with you. First is a donation-based project in collaboration with Red Chair Workroom in Austin. 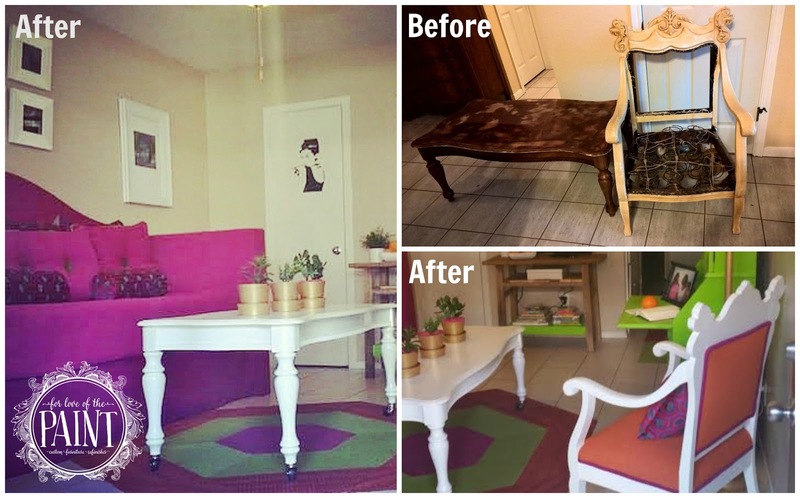 They redesigned a space for a deserving family and gave them a bright spot of color to see throughout their day! The vintage coffee table and chair were painted with Annie Sloan Pure White chalk paint and sealed with Pure Earth Paint's Diamond Coat in Gloss to give it the shine the designers were looking for. The Before and After is below - can you believe these are the same pieces? The upholsterer did a great job on the chair as well. I feel blessed to have been able to contribute in even a small way to doing good for a family that could use a little sunshine! Thank you for including me in your Revolution Redesign project! I am honored and look forward to working with you again in the future.